Who can honestly say they saw that movie coming??! For me the number ONE thing about The Last Jedi is how rich the story is. It’s got enormous depth! So much happens, there’s almost enough content for two movies. I don’t even know where to start, but since this movie is so focused on the characters (hurrah! ), that seems like a good place to start my review. Put the kettle on, this may take a while. Mark Hamill should be in line for an Oscar. I’m dead serious. What an absolutely sensational performance. He re-visited one of movie history’s most famous characters and brought him to life on screen immaculately. (Just don’t talk to me about the green milk scene). Undoubtedly the performance of a lifetime, this portrayal of Luke is unforgettable and so emotionally charged. Luke’s self-imposed exile has left him cranky, cynical and just a little sarcastic. Oddly, it suits an aged Luke and watching those initial scenes was an absolute joy. Luke’s re-appearance in the final act of the movie was nothing short of superb and the shot of him walking out alone to face Kylo Ren is simply immense. I was completely taken in by the ‘Force projection’ that Luke had manifested from his island home. Again, credit to Rian Johnson because this was something we’ve never seen in canon Star Wars before. This entire scene was easily my favourite of the movie it was so cleverly done. And hell, Luke Skywalker back in action again… who could resist that! He died on his own terms – as Rey said, peacefully with purpose. But mainly - and forgive me for being so childish - I don’t have to go in to Episode IX stressing out that my hero is going to die at the end. Because to be honest that’s what I’ve been expecting ever since the sequel trilogy was announced back in 2012! This in turn surely means Luke will return in Episode IX as a Force-ghost to help complete Rey’s training. And possibly he’ll visit Kylo Ren too, given how his final words were “See you around, kid”. This was an intense performance by Mark Hamill and I could not have been more impressed by the way in which he delivered his portrayal of the aged Jedi Master. Rey’s dialogue with Luke throughout the opening hour was definitely my favourite story arc of the movie and really sets the feel for The Last Jedi. I loved the pace of the entire Rey/Luke story, her persistence and belief in Luke. Let’s not forget, The Force Awakens was essentially all about finding Luke, so Rey’s role was all about convincing him to come back. Her complex relationship with Ben/Kylo is central to the entire movie and the scenes they’re in together are really heavy, particularly their ‘telepathic link’. So much character driven dialogue, with Rey central to so much of that! Rey’s encounter with the dark side on the island was really intriguing and I loved how Luke’s reaction to this was sheer terror. I found her training scenes really enjoyable too, particularly combined with Luke’s dry sense of humour (the “Reach out” scene in particular was great). And I loved the contrasting scene in which Rey confronts Luke about Ben/Kylo; she does not mess about and was not afraid to take a lightsaber to Luke to get him to talk. Brilliant stuff! And wasn’t it great that her parents turned out to not be of any consequence? Another brave decision by Rian Johnson because it would have been really easy to have made her Luke/Obi-Wan’s daughter and have her heritage be known and her character more defined. Instead, Rey’s character retains more mystery and in the process I lost several bets (and yes I’ve paid up). Rey moving the rocks to free what remains of the Resistance was great and the scene was not without significance. With most of the Resistance’s leadership now gone (and we know that Leia won’t be in the next movie), The Last Jedi places Rey at the heart of the Resistance, ala what happened to Luke at the end of A New Hope. A great performance by Daisy Ridley and so much character development for Rey, it was fantastic. We all knew seeing Carrie Fisher on the big screen was going to be an emotional experience. Her final performance as Leia is a stand-out one for me, and it really reminded me of the way she made us all feel about Leia in The Empire Strikes Back. When Leia got blasted out in to space with Ackbar & co… and was seemingly dead… but then used the Force to get back to safety?!! Incredible! We’ve always known that Leia has Force abilities and anyone who’s read the Aftermath trilogy or Bloodline (a must read!) has learned of further evidence of this. But watching Leia on-screen use the Force so dramatically was brilliant. Overlay this with John Williams’ classic Leia theme and, for me, I think this will go down as one of Star Wars most iconic scenes. And to be honest, Carrie Fisher deserved a big moment in this movie. As much fun as it was watching her trade insults with Han in The Force Awakens, her role in this movie was far more substantial and all the more enjoyable for it. And forgive the fanboy inside me, but I was so glad we got to see Leia and Luke on-screen together one last time. It was significant from a storytelling perspective too; for them both to acknowledge that Ben Solo was beyond redemption probably all but diminishes any theories that Kylo Ren might turn back to the light in Episode IX. Everyone had questions about Snoke; who is he? Where was he whilst the Emperor was the main man? What species is he? Is he in fact a really aged, pissed off Mace Windu? (you can thank @WhiteStarPrime for that one). JJ Abrams very deliberately gave little away about Snoke in The Force Awakens and I for one fell in to the trap that Snoke would be our main villain for the sequel trilogy (before likely being killed in Episode IX). Kylo Ren’s spectacular betrayal and murder of Snoke was amazing and (let’s be honest) shocked us all. Bravo Rian Johnson, that’s exactly what we needed because the instant that Skywalker's lightsaber cut through Snoke, we all realised that no-one had a clue where this sequel trilogy was going. The scene that followed Snoke’s death was spectacular, with Rey & Ren combining brilliantly to defeat the former Supreme Leader’s guards (who were pretty badass to be fair). I had it all figured out; Ren had been so badly tormented by Snoke, he’d seen the light, had turned against his master and like Vader he had redeemed himself. He wants to rule the galaxy himself! Kylo Ren is officially the big boss now, and General Hux is the first to learn this. And if anyone in the movie theatre still doubted this, his “I want every gun we have to fire on that man” line directed at Luke cements his place as our main villain. Snoke’s barrage of verbal abuse at Kylo Ren meant we also ended up feeling somewhat sorry for Ren; and yet, this is the man who killed Han Solo?! And now he’s broken Anakin’s lightsaber in half as well? He’s not making any friends here. I think he’s a great lead villain because he’s so off-balance, he’s so emotionally unstable and now, crucially, he hasn’t got a master anymore. 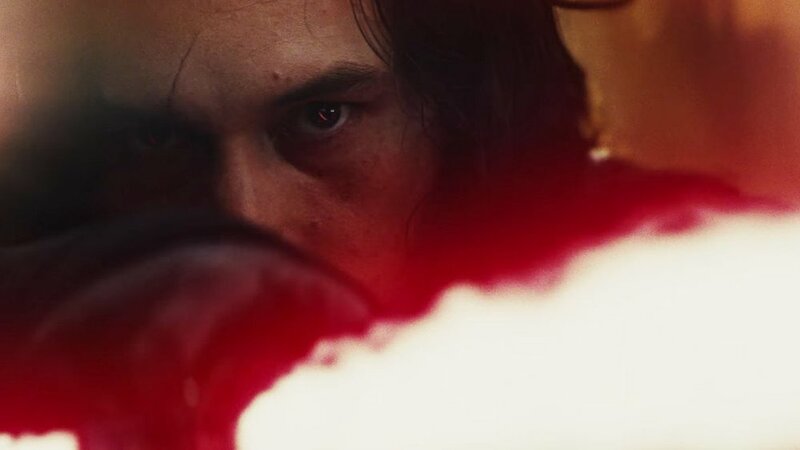 Kylo was impressive throughout the movie for me and despite there being some critics of his performance in The Force Awakens, I feel Adam Driver has really made the character his own. I really like Finn and every time he’s in a scene, I realise how much. John Boyega is a terrific actor and he’s so watchable as Finn. I was convinced that he was going to die when he went on his suicide run against the massive First Order weapon, and given how many deaths this movie was delivering, I was more than a little relieved that he was eventually saved. A large part of Finn’s role was to find this ‘code breaker’, which was a little contrived I thought. To be honest, my first viewing of the movie left me annoyed at the Canto Bight story arc. Compared to everything else that was going on, it seemed so inconsequential and I was stressed out about what was going with Rey, Ren & co! What I can say is that the Finn storyline is more enjoyable on subsequent viewings because you’re not as desperate to stay with the primary characters. And it’s that recognition, that Finn isn’t quite a primary character that means his scenes are evidently less prominent compared to his scenes in The Force Awakens and frankly that’s a real shame. I really hope we get to see a lot more of him in Episode IX, leading the charge with Rey & co.
His battle with Captain Phasma was ok, but it was actually his escape with BB-8 and Rose via a damaged AT-ST that was the most enjoyable moment as Snoke’s ship fell apart. Side-note: Given that we’ve now had good-guys disguised as bad guys in A New Hope, Return of the Jedi, Rogue One and The Last Jedi, I hope that JJ Abrams doesn’t go there again in Episode IX. With everything going on with Kylo Ren, Rey & Luke, plus Finn on his away mission, you’d think there wouldn’t be room for a decent storyline for Poe Dameron. Rian Johnson clearly felt otherwise. Whilst it was secondary to the main action, this storyline was of real interest and Oscar Isaac’s performance was fantastic I thought. Just like in The Force Awakens, Poe’s character essentially kicks off the movie and I really enjoyed the opening sequence of The Last Jedi. I love how direct Poe is and how he does what he thinks is right throughout this movie and really commits to it. Regardless of the fact he’s not always right of course, I just love his character; classic heroic, bravery with just the right amount of arrogance and humour. And yes, he’s still one hell of a pilot, even if it did cost a lot of people their lives. The cinema’s reaction to seeing the back of Yoda’s Force-ghost head was essentially one huge gasp. It was beautifully done and didn’t feel like some desperate attempt to get Yoda in to the movie; it really worked. Yoda’s advice to Luke played a significant part in the story development. Where Rey had failed to convince Luke to get involved, Yoda essentially succeeded. Watching him laugh like a kid as the Jedi tree burnt down demonstrated that Force-ghost Yoda still has that same spirit we all loved from The Empire Strikes Back. I became very conscious of my surroundings as this scene came to a close. Am I really in a movie cinema watching Luke Skywalker and Yoda sit around and talk? Memories of doing this as a kid in 1983 came flooding back. I’m not crying, you’re crying. It’s a really special scene. General Hux was superb and he’s easily my favourite First Order character. I particularly loved the smile he gave Kylo Ren as he passed him walking away from Snoke. Hux reaching for his weapon when he thought Kylo Ren was unconscious and then quickly changing his mind when Ren came to was great. And his “I can hear you, can you hear me?” scene with Poe was hilarious, particularly when he was trying so hard to sound menacing all the while. Side note: Casting Adrian Edmondson opposite Hux was a stroke of genius and somehow wasn’t even distracting! Rose was fine, but I’ve yet to really start caring about her character. She won me over somewhat when she saved Finn and I really liked her line about “saving the things we love, that’s how we’re going to win”. School report: Must do better next time. I did like Benicio del Toro’s code-cracker character, mainly because just when we thought “Ok, he’s a bit dodgy, but he’s a good guy” (when he gave Rose back her metal pendant) he then got half the fleet wiped out by telling Hux & Phasma what the Resistance were up to. Another nice twist against the norm I thought. Maz Kanata’s cameo was a little forced and I was hoping she might have some scenes with Luke. Could be a possibility for Episode IX. The Porgs weren’t too annoying thankfully. They gave us some humourous scenes with Chewie, but I’m not going Porg crazy like some people out there seem to be. Speaking of Chewbacca, his screen-time was quite limited, but I did love him smashing down Luke’s door. And watching him pilot the Falcon with the classic “Here They Come” music playing was a nice, nostalgic touch I thought. C-3P0 was restricted to just a few scenes too but they worked well. His interactions with Leia and Luke were nice, although his scenes with Poe were actually my favourite. Much more recognisable without the red arm I might add. R2-D2. When Luke turned to see R2, we got a rare glimpse of Skywalker’s smile for a brief moment. R2’s “cheap move” at playing back Princess Leia’s holographic message to Obi-Wan was a great moment for the fans, but it also played a key part in convincing Luke to teach Rey. Admiral Holdo was OK, if a little smug. Courageous, brave and her hyperspace jump into Snoke’s ship was epic to witness on the big screen. The First Order BB droid – that was awesome. As was BB-8’s attempt to disguise himself wearing a rubbish bin. He even attempts to makes the classic mouse-droid noise too. BB-8 had some great moments, but he wasn’t quite as memorable as he was in The Force Awakens perhaps. Good to see Nien Numb survived the movie. You never know when the Falcon might need a pilot. I was gutted about Admiral Ackbar’s death. Give or take Rogue One, the First Order have killed off more characters in two movies compared to the Empire! Side-note: can I just say I’m a little confused how we went from calling the good guys “the Resistance” to calling them “the Rebels” again. I think of Rebels as being against the Empire, and the Resistance against the First Order. No biggie, but I don’t get it. The First Order can track them through hyperspace? That’s impossible though? What was Rian Johnson thinking making up such nonsense? Oh wait…he didn’t. I love it when something from one of the Star Wars’ movies or TV series directly influences events/stories in another. On that note, I also loved hearing Luke directly mention Darth Sidious by name and subtly make reference to the events of Revenge of the Sith. It’s the little things. As I’ve mentioned throughout, so much credit has to go to the writer and director Rian Johnson. Writer-directors have always fascinated me. If a successful writer has got the talent to direct, it’s the ultimate combination – they can tell that story on-screen better than anyone in my opinion. James Cameron, Quentin Tarantino, Christopher Nolan and The Coen Brothers. And you can add Rian Johnson to that list too. Johnson is well known for his use of deep contrasting colours on film and The Last Jedi is no exception. Top of mind for me is the bridge of the First Order dreadnought where everything appears in a stark contrast of red and black. (Side note: I loved the character of Captain Canady; he had a really evil arrogance about him that personified the First Order. Great voice too!). The direction of this movie is of the highest quality and he really captured the final showdown between Kylo Ren and Luke perfectly. I’m already tempted to go and watch it again just thinking about it now. The Last Jedi is beautifully written, and we get a deep exploration of the complexities of the Force. Johnson cleverly manages the script so that right through to the end we never lose sight of the characters and we stay focused on their journey. I love the dialogue throughout, my only criticism being the use of expressions like “what’s that now?” and “who’s this now?” which feel more at home in an episode of Fargo than in the Star Wars universe. The final scene of the young boy on the Canto Bight planet was really emphatic and again it’s so unlike the ending of any other Star Wars movie. Watching him use the Force to grab the broom was really significant as it opens up all new possibilities as to who might rise to face The First Order in Episode IX. The Last Jedi has really shaken up the Star Wars universe and it means we go in to Episode IX not really knowing where we are going. I’m more than comfortable with that. Next years ‘Solo’ movie has a hard act to follow for sure.